While finished props sitting on a white background are always nice for a simple portfolio piece, I had to see what my helmet looked like with a complete set of armor! 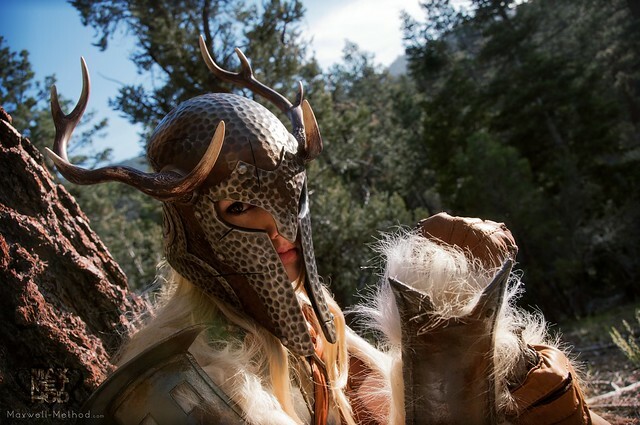 Manzi DeYoung is the model and builder of the Iron Armor/weapons and Dragonborn costume shown here (armor and cloth work? 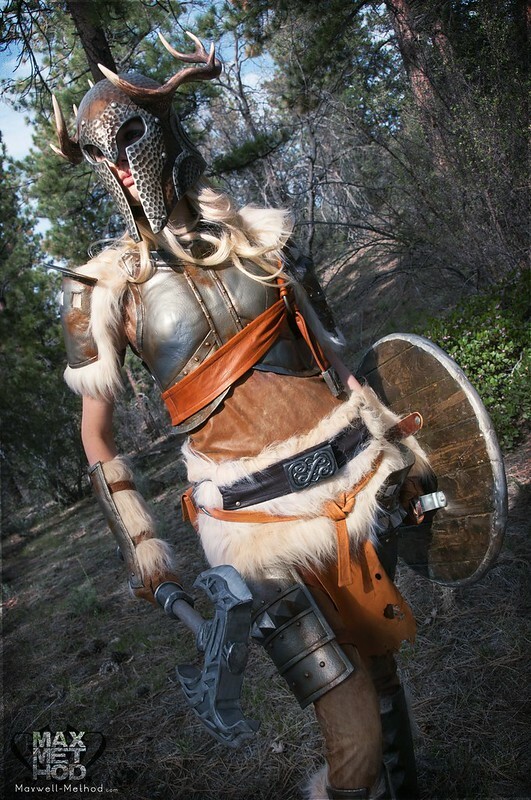 This lady is going to take all my clients!) 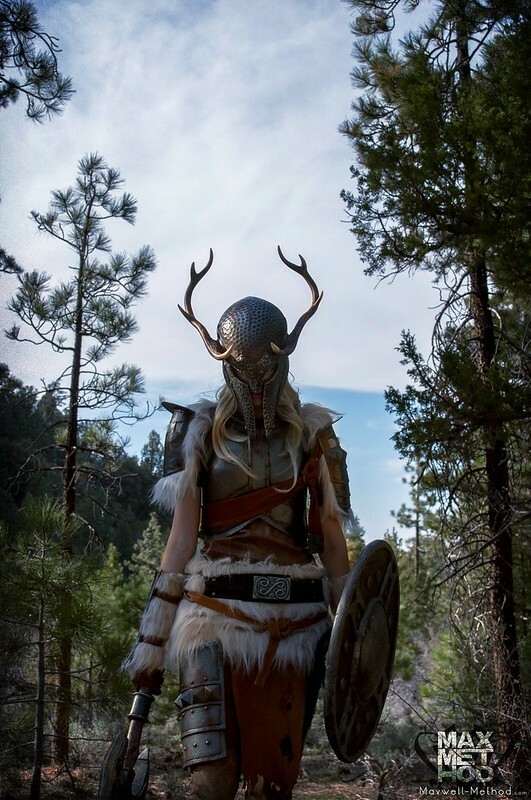 After following her comment to her own facebook fanpage, I dropped her an email asking if she wouldn't mind doing a shoot with her armor and my freshly finished helmet. I got a very enthusiastic "yes" and we were off! All photography work is credit to Max Song. 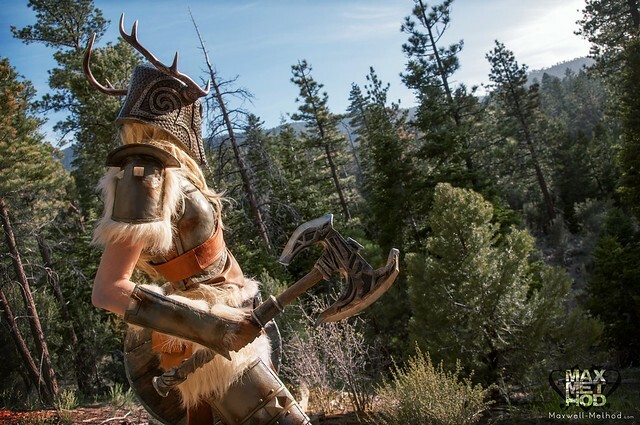 A few medical issues prevented the final shoot from lining up with my blog post about the helmet build process, but the results were worth the wait and I think its better to showcase cool pics like this on their own post instead of after along build log anyways. 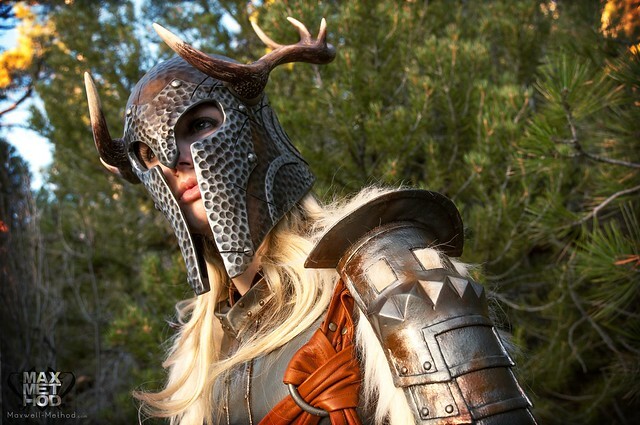 I think its worth clarifying a second time just in case anyone missed it: The only thing I made here is the helmet. 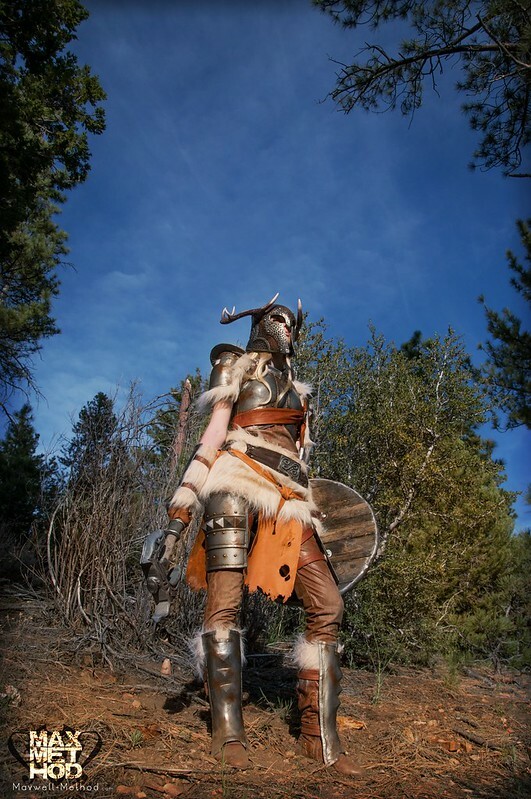 Manzi is a fellow prop maker out on the west coast, and the armor she's modeling is a result of her efforts, not mine! 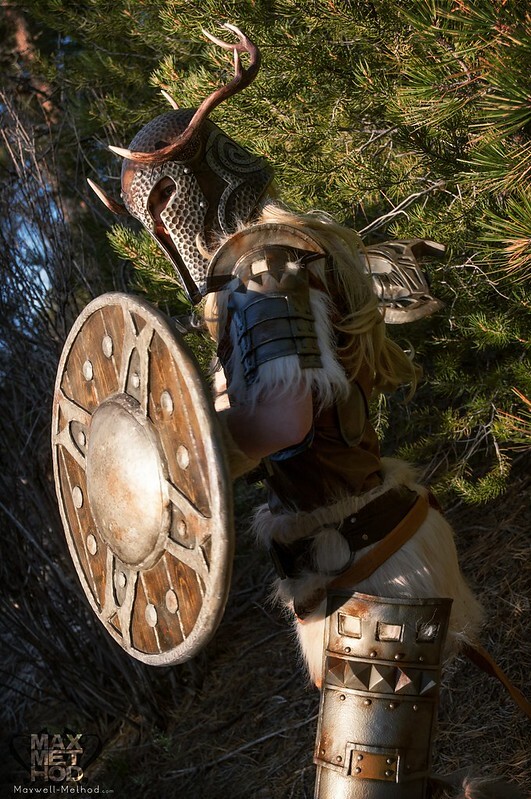 If you'd like to see some more of Manzi's work, you can check out her website here. I've only posted a handful of my personal favorite shots from this photoset, but more can be found (and, as always, in higher resolution!) on my Flickr page. 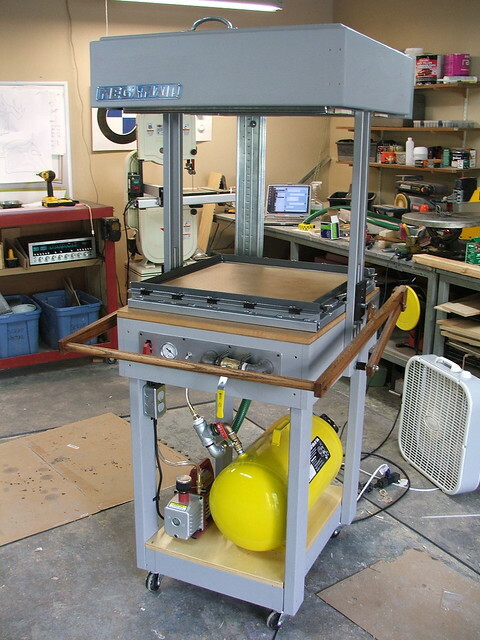 Quite a bit ago I was able to get my first vacuum forming machine up and running, using not much more than an old toaster oven, a shop vac, and my parents' old telephone table from their kitchen (with, I should add, their permission to do so!) 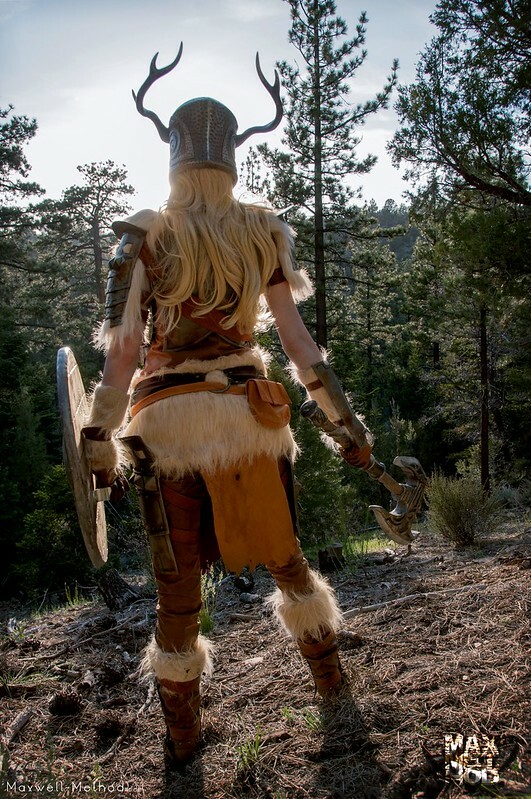 Anyone interested in that project can take a look at the build log here. Its been a great tool to have and has been very useful for the past few years its been in service. This budget-miniformer has worked wonderfully considering the cost and time it took to produce, but as I've been getting more and more complex projects recently, I've been needing a machine capable of pulling larger pieces of plastic as well as thicker and more detailed pulls. 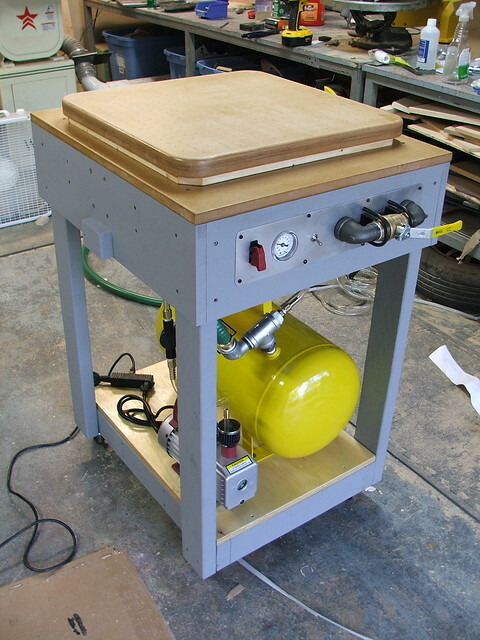 I had done a lot of research in the past when planning my mini-former project, and had run across the Protoformer Vacuum Forming machine plans over at www.build-stuff.com more than a couple of times. The plans are $65, and worth every penny. 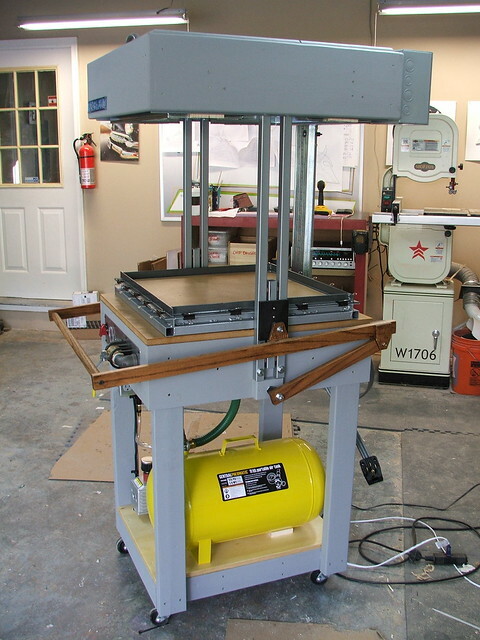 I highly suggest anyone interested in making a large professional level machine look into purchasing either these, or some of the other smaller format machine plans available on the Build-Stuff website. The end result (after a lot of effort and a fair bit of cost, its worth mentioning) is a hugely capable and very professional looking tool. My personal build did not follow these directions exactly; I made modifications to the plans in certain key areas which other people who have built these instructions will recognize right off. These were not improvements, but rather implemented as a result of budget concerns, personal limitations (I don't have access to welding equipment) and the types of jobs the machine will see. I'll explain these when they pop up in the project log. 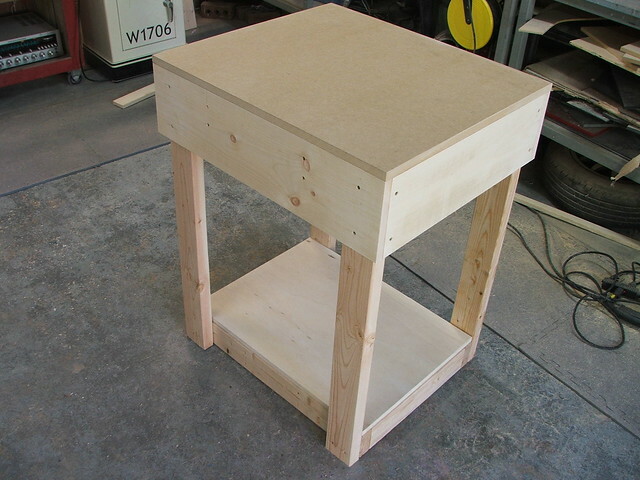 First off, I started by building the frame table. 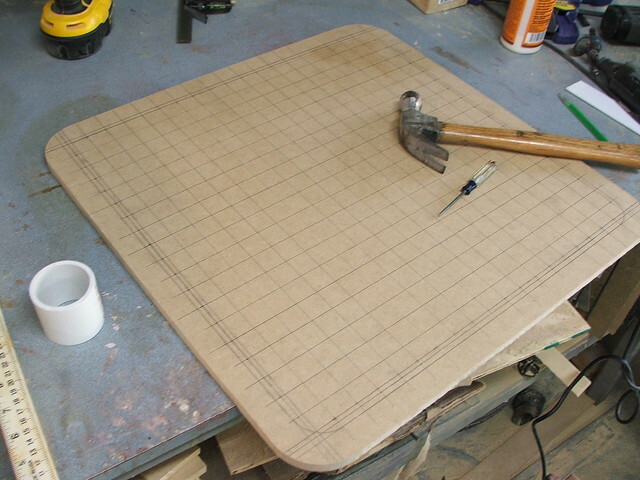 This is a bit smaller than the ones laid out in the instructions as my shop is pretty cramped these days and I needed something with a smaller footprint. 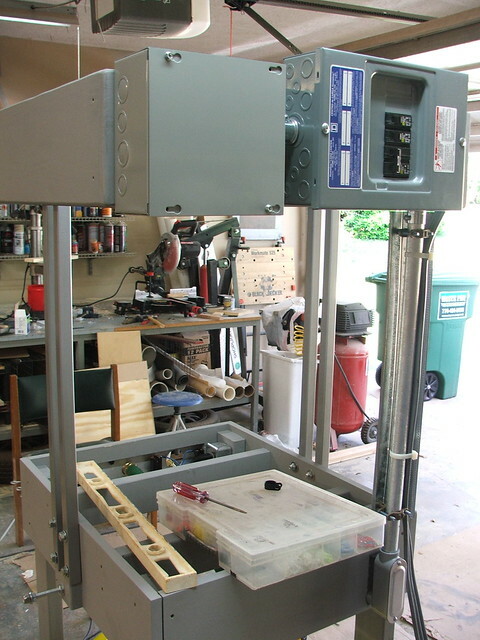 Also, I had plans to change the lift rails and oven supports, and I needed a narrower chassis to do so. 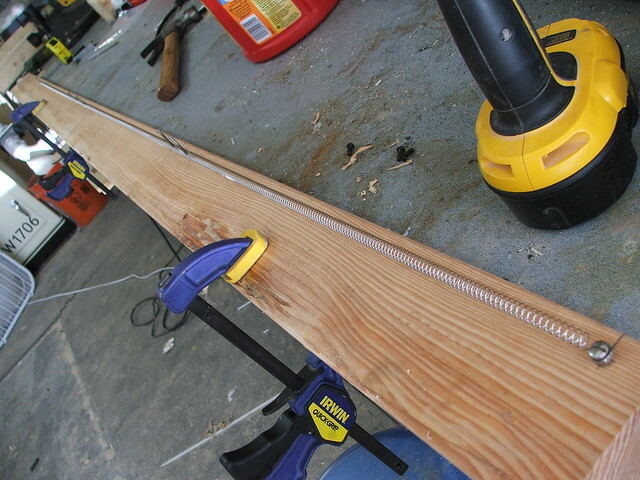 These are just 2x4 framing studs, glued and screwed together. 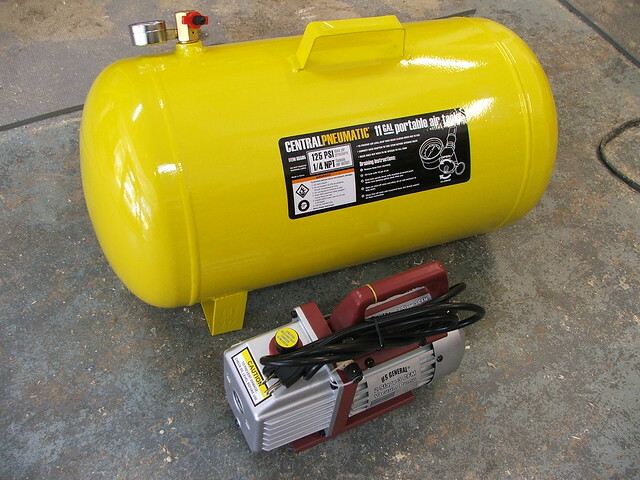 The vacuum itself would be provided by a 3cfm air pump I purchased at Harbor Freight. The 11 gallon surge tank that holds the vacuum was also from HB. To pull thicker materials like Acrylic, I may have to add another tank in the future, but for the styrene and PET plastic I'm working with now, these two will work fine. 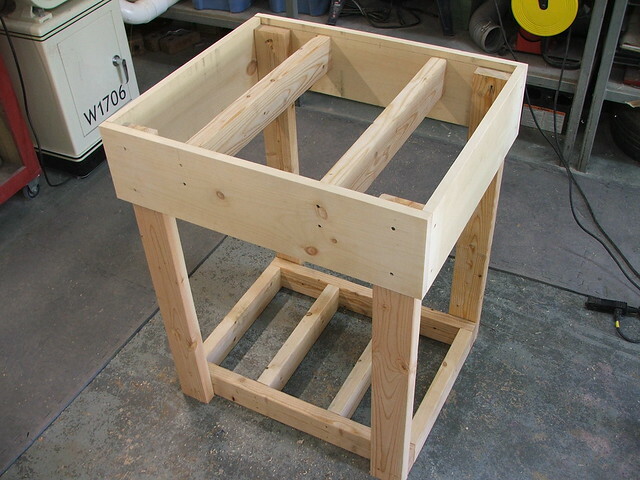 A shelf was added to the bottom of the cart, made from 3/4" plywood. 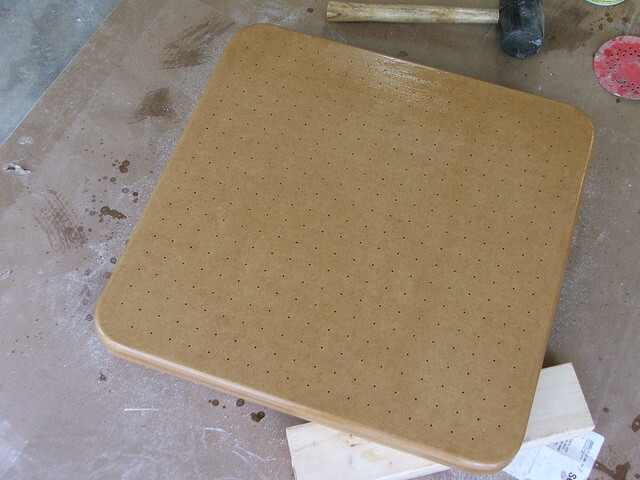 The upper table area was cut from 1/2" MDF. Both were sealed with shellac before mounting onto the machine. 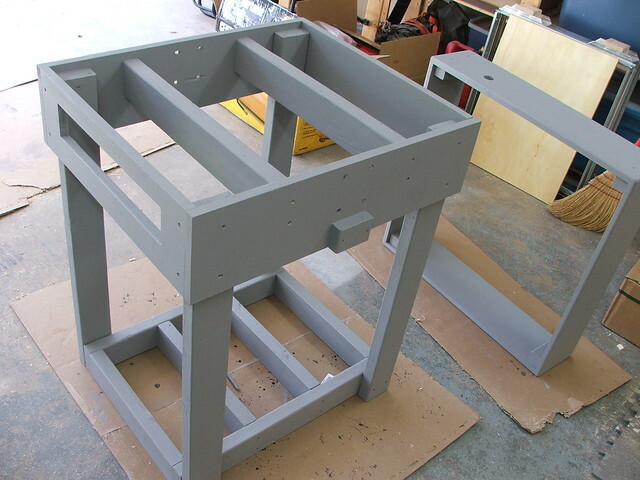 After mounting points were drilled, the frame was painted with flat gray house paint left over from my laser cutter cabinet project. 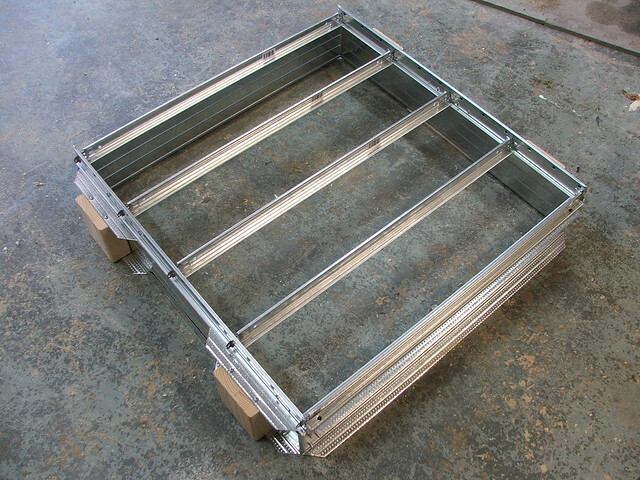 The original plans call for the oven support arms to be a set of 4 uprights welded to a steel box that will sit on the chassis. 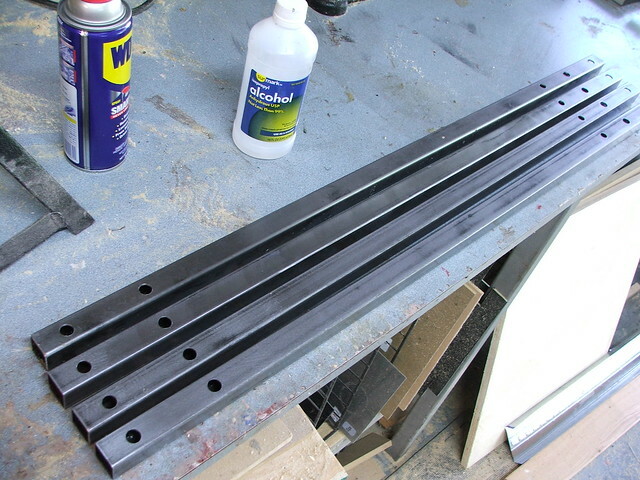 I chose to drill holes through the side of the uprights and bolt them directly to the chassis sides. This saved me some money in box steel as well as saved the complexity and time of cutting parts to length and welding them together. 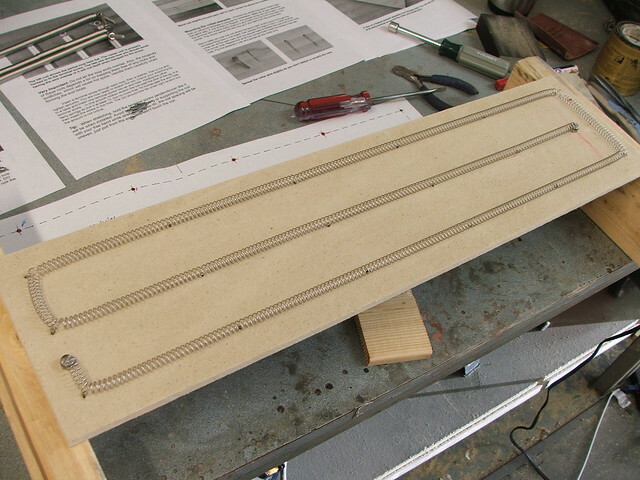 I also substituted 1" steel box stock for the 1.5" outlined in the instructions. My machine will see occasional use every few weeks and I didn't think the added beefy steel was necessary. 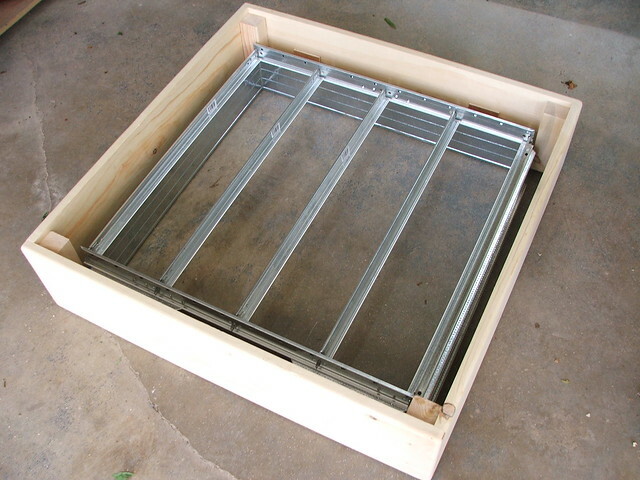 The oven frame box was built next. 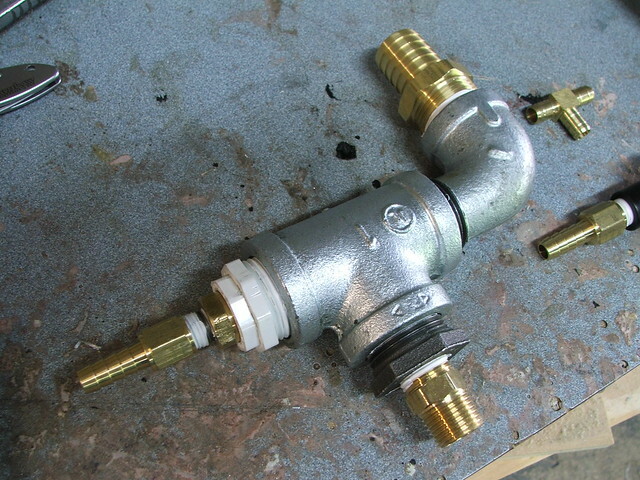 This is a proprietary design and made to specifically hold the heating elements sold by Build-Stuff.com. I chose to leave all the parts of the machine related to the heating and electrical system as close to the instructions as possible. 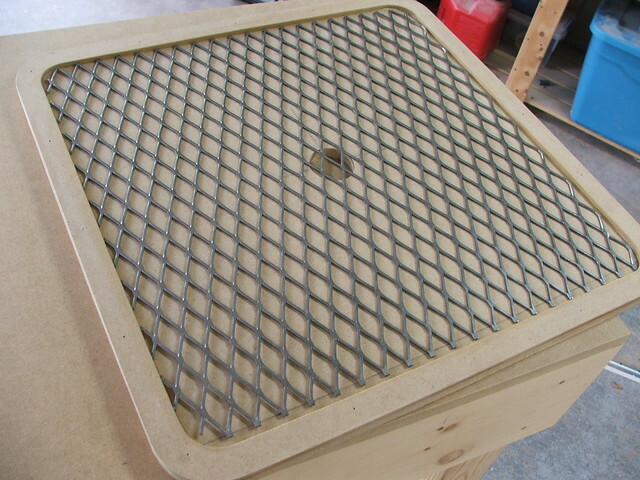 The outside of the box is made from poplar, and the inside metal grid secures to the outside box with a series of screws. I used 2 pieces of 1" angle steel to hold the oven box in place. 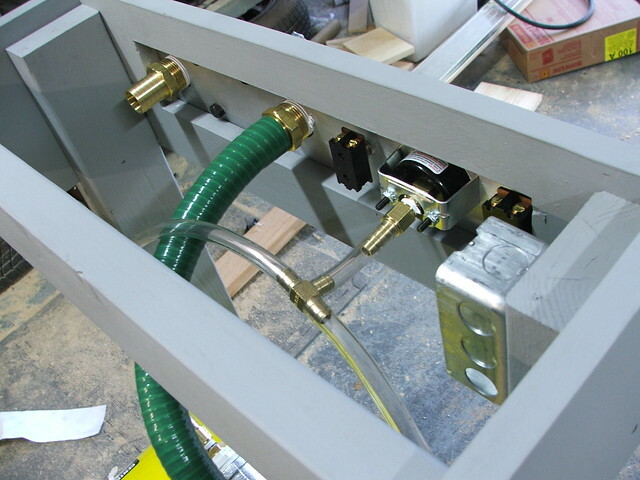 These are bolted to the uprights and pull double duty; they keep the uprights a set width apart and keep the oven box level and above the platen. 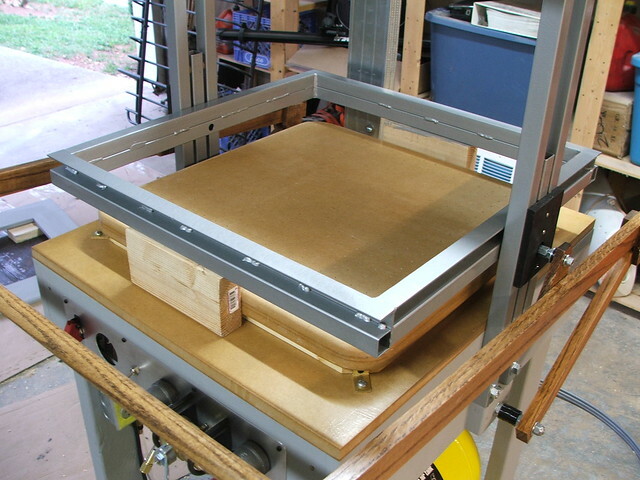 The platen was also modified, though again for budget reasons. I chose to repeat the design from my first vacformer, but incorporate cues from the Protoform design as well. 2 pieces of 1/2" MDF sandwich a 1/4" piece to create the inner cavity. 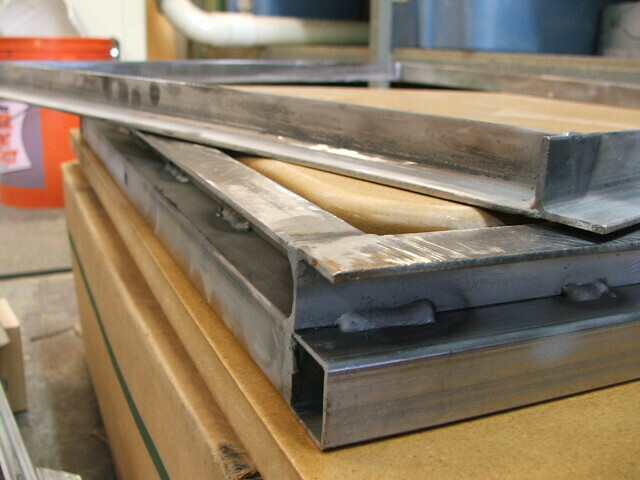 A steel mesh frame is mounted in between the open sections to make sure the cavity doesn't crush inward under the pressure of the vacuum. 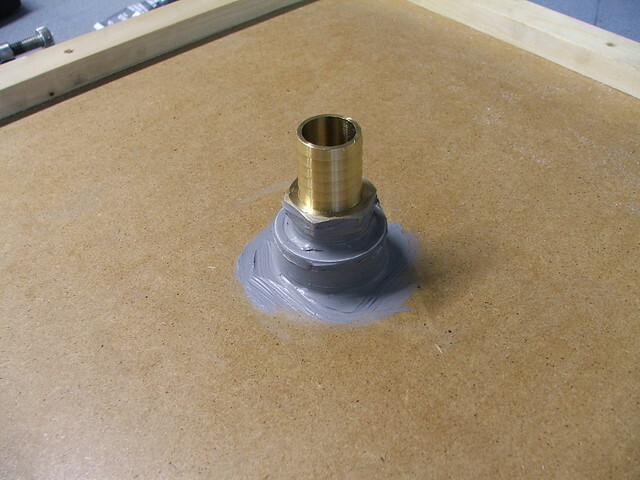 A 1" threaded PVC insert was cut from the bottom center section and sealed with RTV silicone. 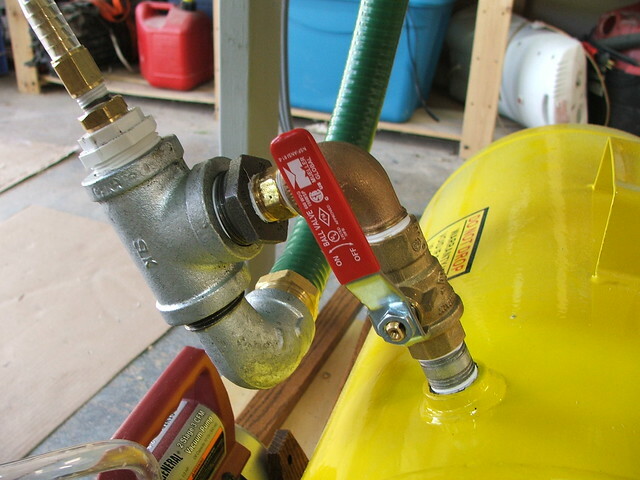 The hose from the dump valve to the air tank will mount here later. 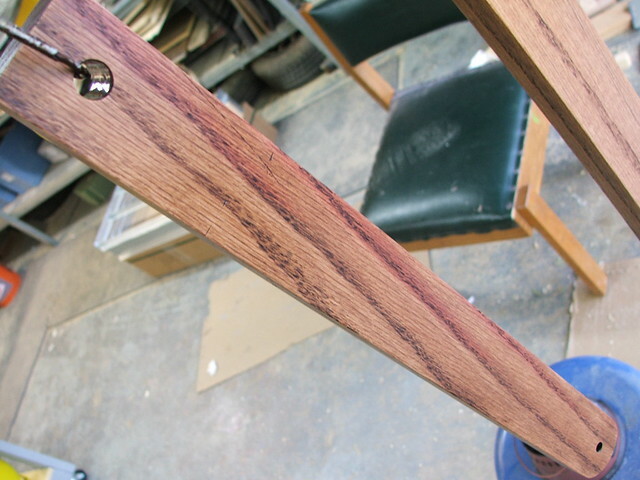 The upper section was routed to have a round corner, then the assembly was glued, clamped, and sealed with shellac. Unfortunately, a test pull once the machine was finished showed that the plastic got hot enough to pull the shellac back out of the wood. 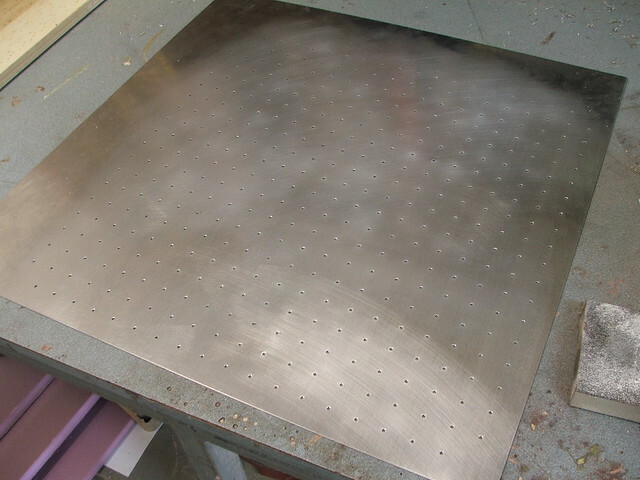 I added a thin aluminum plate with matching drill holes, and the problem was solved! 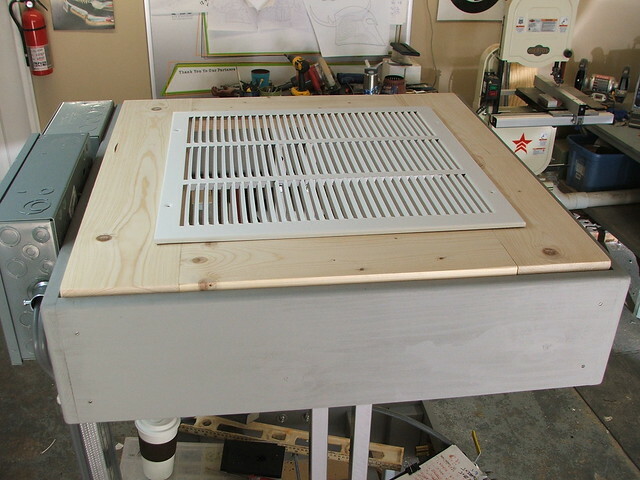 The air system I showed earlier came next. 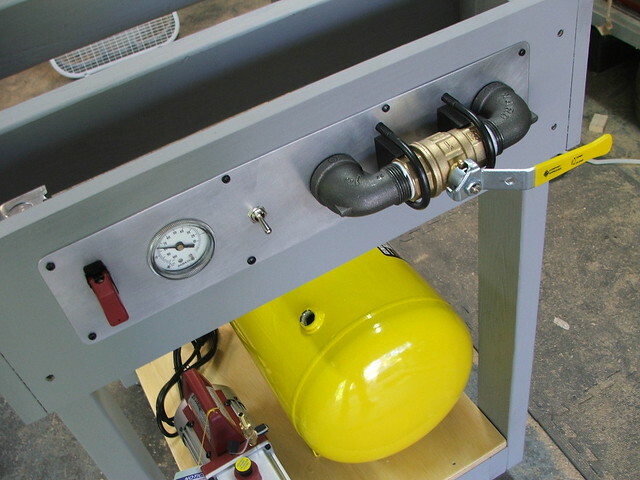 The pump evacuates an air tank, and the amount of vacuum in the tank is shown on the gauge at the front of the machine. When the plastic is lowered to the platen, the valve is opened, allowing vacuum to be pulled though the platen and into the forming area. 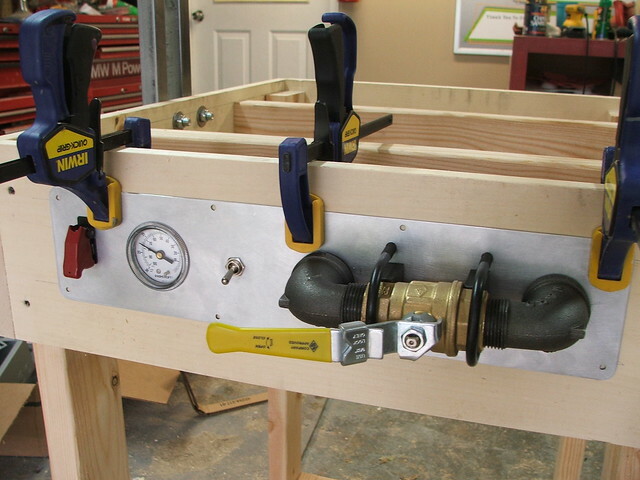 The pump and tank were screwed to the base shelf, then I assembled a menagerie of plumbing fittings and adapters to connect all the parts. 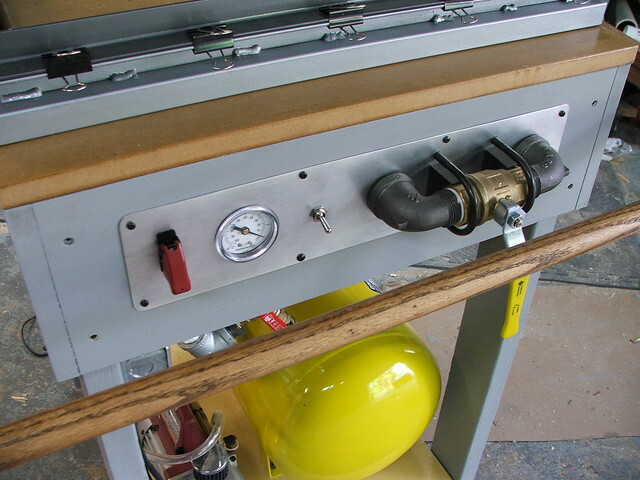 On the front of the machine, there are two switches that control the air pump and heating coils, as well as the vacuum indicator gauge and the vacuum release valve. 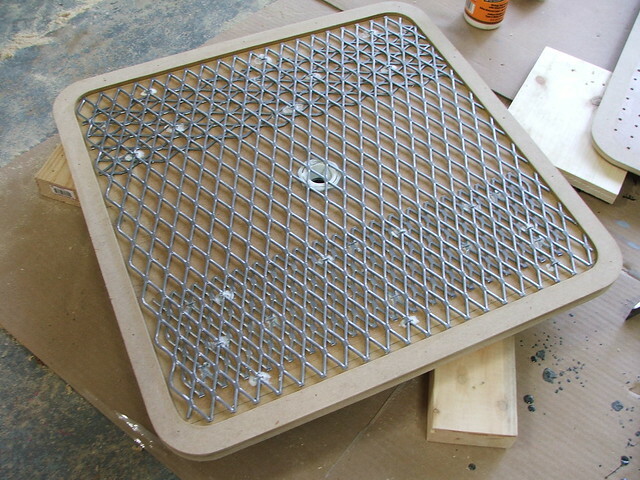 Mounting points for these were trimmed out of an aluminum plate. 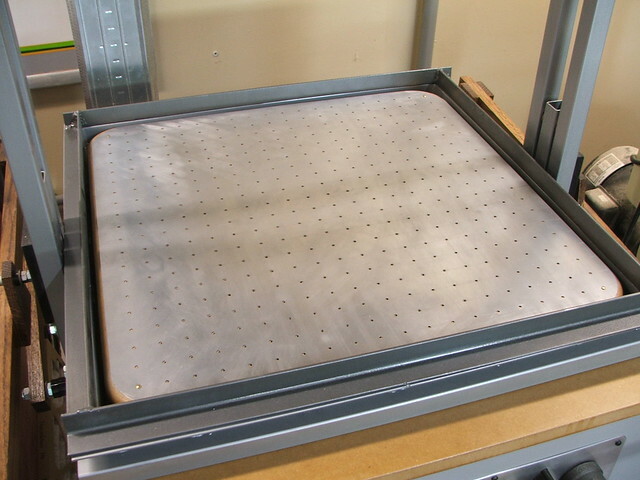 With these parts assembled, I now had the vacuum half of the forming machine finished! 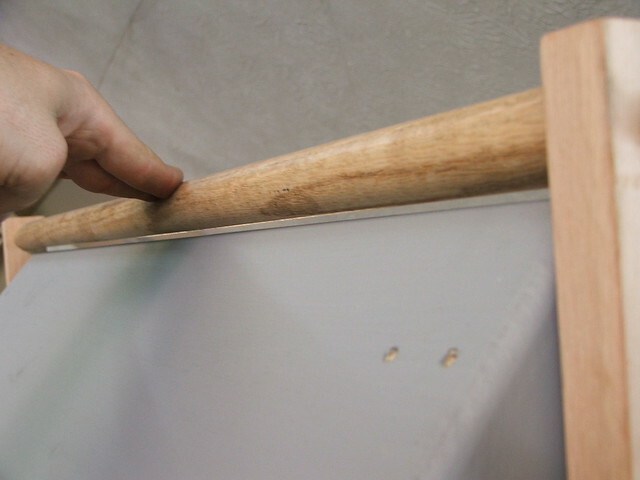 The oven support rails came next, and were bolted to the side of the machine. 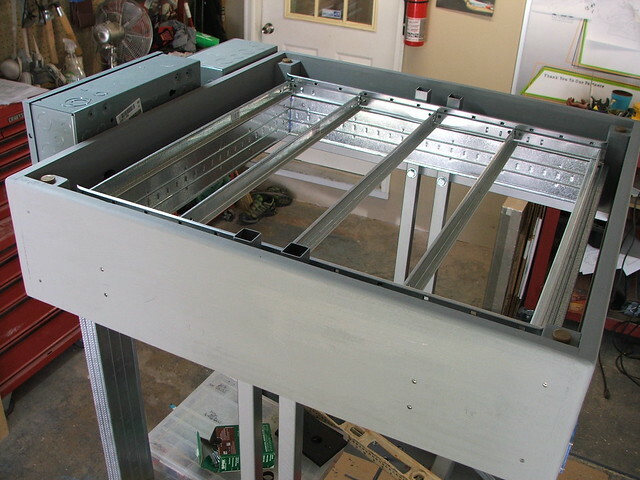 The oven box was then lifted up and mounted to the angle steel bars. 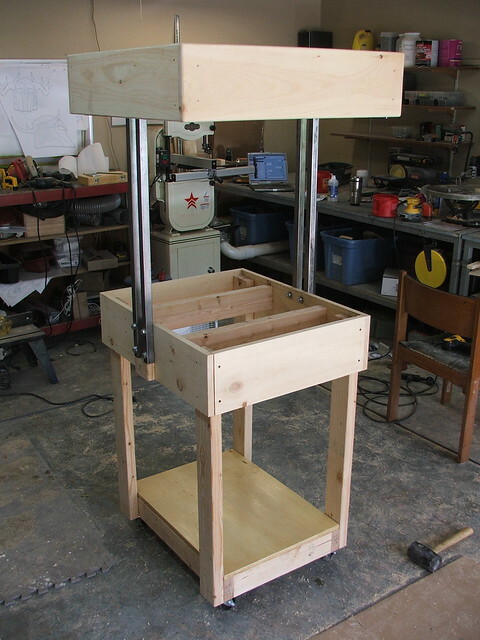 As my dimensions were changed somewhat from the original Protoform plans, the lift arm mechanisms in the instructions would no longer work for my machine. 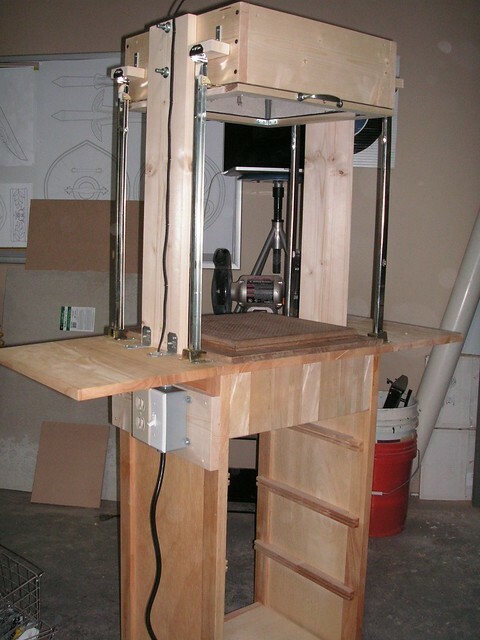 I employed a very similar system as shown in the diagrams, though the lift arms I built are made from red oak. This, again, was a budget and capabilities issue since I don't own a welder and buying another 8 or so feet of box steel would seriously anger my bank account. 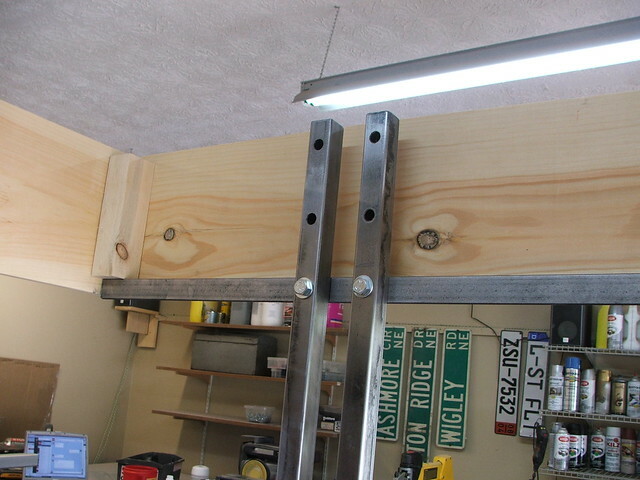 The lift arms work quite well, though the wood does flex more than steel would. 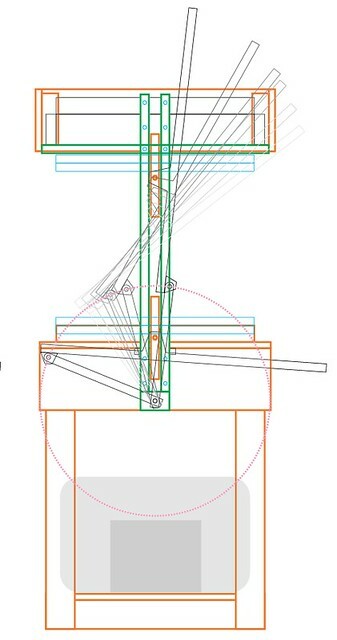 You need to lift the arms by the sides of the center handle using two hands, whereas I imagine a steel assembly could be lifted using only one. These lift arms attach to two 10" long sections of box steel which ride between them. 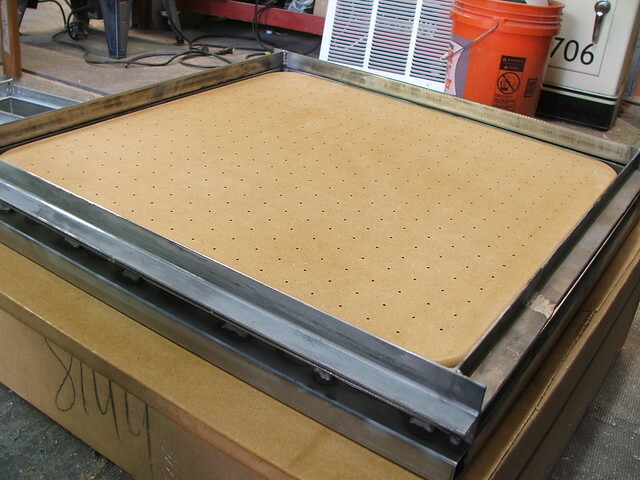 These center rails are then bolted to the plastic carrying frame, which moves the material up to the oven and back down to the platen. I couldn't get away from welding forever, so after cutting all of the parts for the plastic carrying frame, I asked my uncle James for a few evenings worth of his free time to weld up the frames for me. James has plenty of fancy welding projects under his belt (race car roll cages being chief among them!) and the results were perfect. 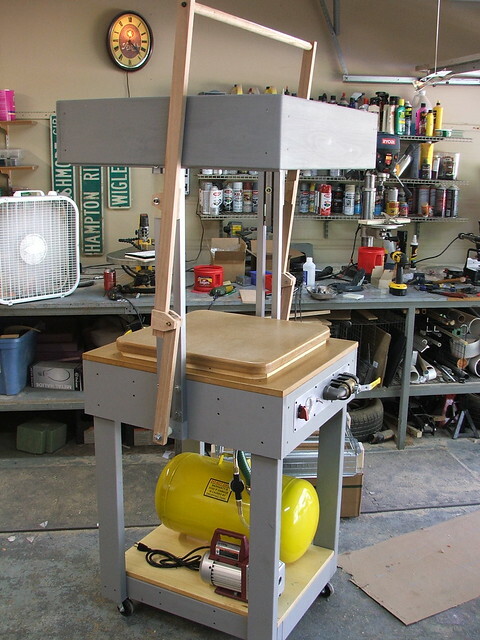 I stained the wood on the lift arms, painted the frames and bolted everything together for a test run. The lift bar clears the oven by the tiniest margin and I have to stand on my toes to reach it, but it works wonderfully! 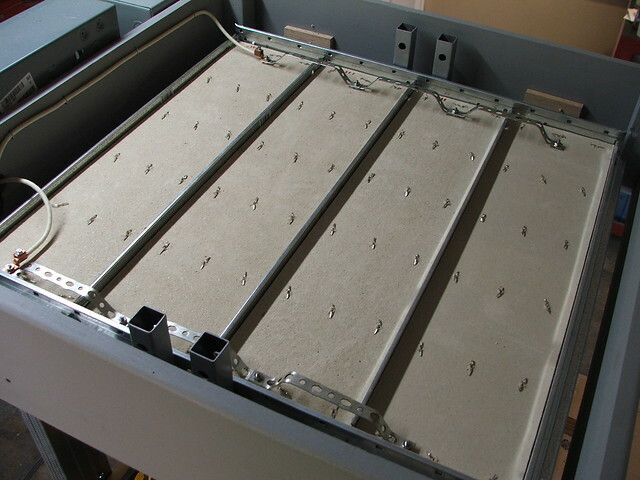 I'd like to explain the heating elements and electrical wiring in detail, because I try to share as much experience and knowledge as I have for other people to learn from and try out themselves. Unfortunately, this time I'll need to be a bit more reserved about distributing this information. 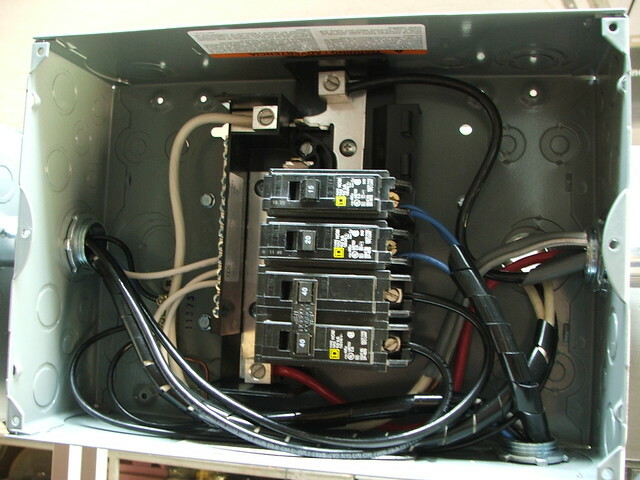 This machine runs 220V power, is built with its own sub breaker box, and is tied into a 50A breaker in my house. This is easily one of the most dangerous projects I've ever constructed, and the simple fact is that if you want to build your own, you should go to www.build-stuff.com and buy the Protoform plans. I should note I have no stake in that company, but the instructions are comprehensive, and detailed and far better than what I can summarize here. $65 is a bargain for the amount of information contained in the PDF you get! My garage used to run off a single 15A 110V breaker, but this has increased exponentially in order to run this one tool. I had an electrician install a new 220V 50A breaker for this machine alone, and also install a new 20A 110V breaker just for the rest of my shop. 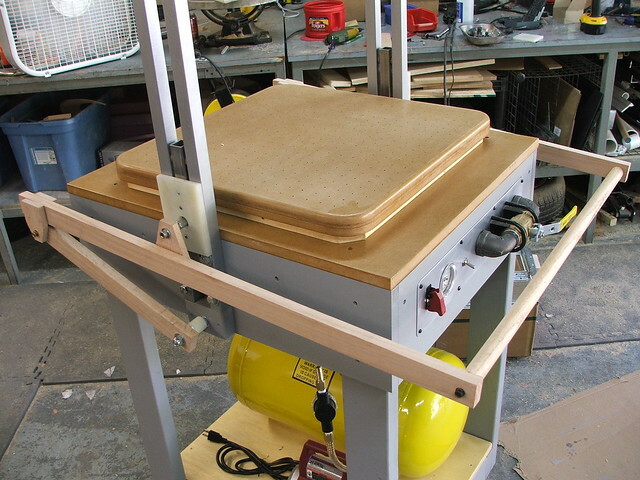 I can finally turn on the bandsaw without killing my stereo or having to turn off my space heater! The heating elements are another kit offered by Build-Stuff, and the kits scale depending on what kind of machine you're building. I ordered these, as there's no need to reinvent the wheel, and the kits came quickly with clear and precise instructions. Assembling everything took about half a day. These things get HOT, and in a hurry too. Full working temp is reached in about 2 minutes. The nichrome wire is a bit intimidating to work with at first, but it becomes easier the more you install. 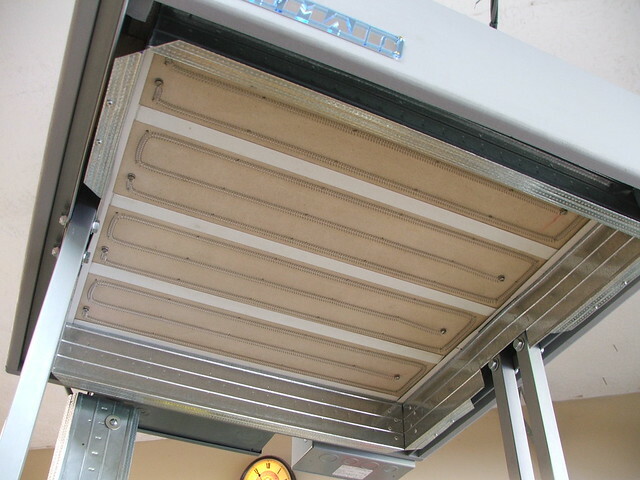 The last thing I needed was a vent cover to protect the heating element wiring from any overhead junk. This was made out of leftover bits of poplar and a large air conditioning vent. With the oven complete, I just needed to do some test pulls. 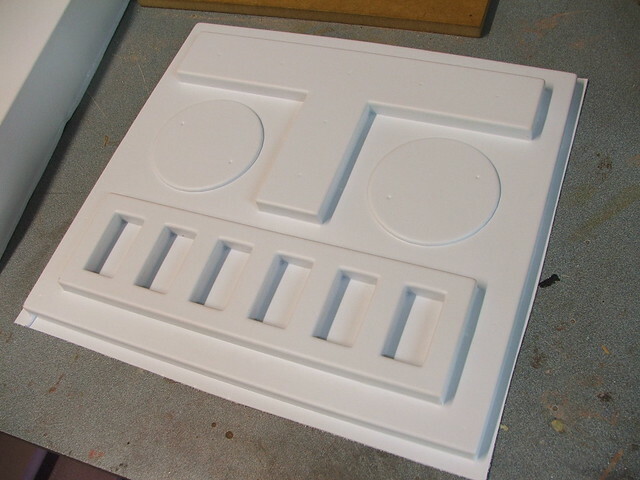 I'm in the middle of remaking the Mr. Destructoid helmet (another old project from back in 2009) for the guys over at Destructoid.com, and all of the parts will be vacformed plastic. A few of the bucks were finished enough to pull a test piece, shown in the video below. This new vacformer ran easily 10 times the cost of my first vacformer project, but the results are worth it. I'm actually considering updating the little one with its own pump and vacuum tank in the future to improve its performance as well. Thanks for reading! More pics of this project (and a bit more explanation of some of the components) are available on my Flickr account.